Fairly standard looking stone church dating from the early 19th century. 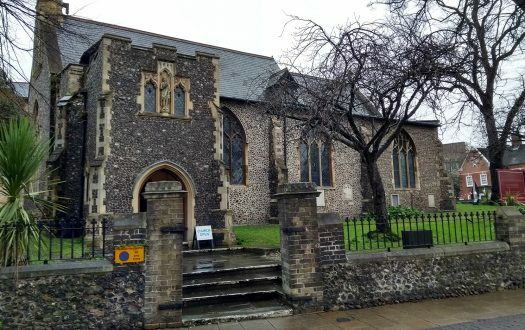 Its features include a small bell tower at the west end, and a graveyard surrounding the church, with several inscriptions from around 1820. The choir end of the church has a slightly lower ceiling and its rafters are painted green, in marked contrast to the dark brown colour of the rafters in the nave. 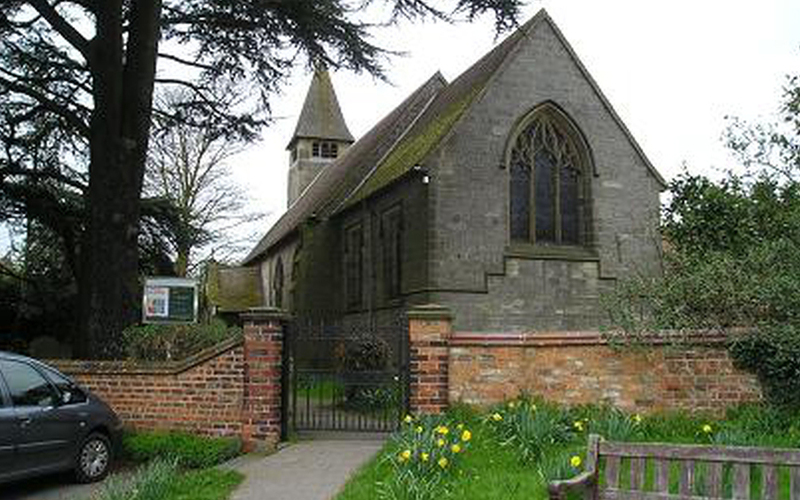 All Saints is one of two churches in the parish of Nether with Upper Poppleton, which between them serve what is now the single village of Poppleton. There is a service at each of the parish churches on Sunday, with usually an early eucharist at St Everilda’s at Nether Poppleton, followed by a 10.00am service (which may be communion or morning prayer) at All Saints. 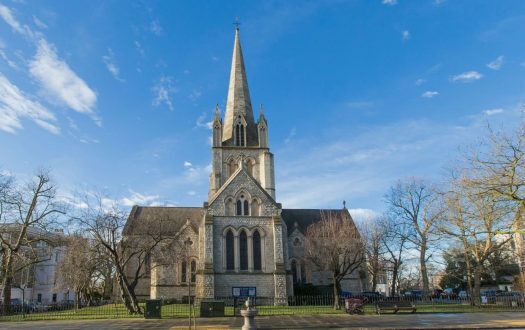 The parish is one of the many organisations that foster a community spirit in the village, and it has links to most of the others, not least through producing a comprehensive monthly newsletter. More specifically, its activities include two Bible study groups, a walking group, and a ‘men on their own’ group (aimed mainly at older men). Poppleton is now in effect an outer suburb of the cathedral city of York. 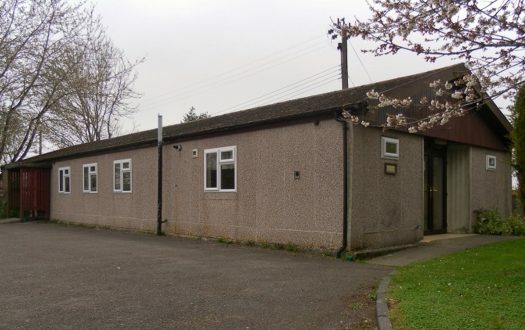 It has a population of about 5000, of whom more than half are aged over 60, although the village includes both a primary and a secondary school. It was originally formed back in 1866 by a merger of the then separate villages of Upper Poppleton and Nether Poppleton. All Saints is situated facing the village green in Upper Poppleton, along with the Methodist church (dated 1905) and two pubs. Nether Poppleton is by far the older settlement, dating back to Saxon times, as witnessed by old earthworks (listed as a ‘national monument’ though not yet archeologically excavated) and by records referring to a nunnery founded by St Everilda around 680AD, as a daughter church of the famous nunnery at Whitby founded by St Hilda. Certainly the older parts of the present St Everilda’s church date back to around 1150AD. About eight different people led various parts of the service, such as readings, liturgical prayers, congregational prayers, and sermon. Strikingly, none of them had a marked Yorkshire accent. About one-third full, with about 30 people present. A lady at the door said ‘Good morning’ as she gave us the service sheets for the day. Standard English pew, acceptable. As the weather was cool though not freezing, almost everyone at the service kept their overcoats on. The church bell was tolling, with the bell-ringer visible at the rear of the church (i.e. pulling on the bell-rope from the tower above). Otherwise, it was fairly quiet. A short service sheet comprised of extracts from New Patterns for Worship and New Hymns and Worship Songs: Supplement (referred to as The Angel Book because of the picture on its cover). Copies of The Holy Bible, New Revised Standard Version were also in the pews, though the readers read from a different translation. Fairly low on the Anglican candle. No one was robed, including the preacher (who turned out to be the vicar, cold notwithstanding). The prayers were all spoken rather than chanted; there was no incense or such-like. Readings and prayers were all done at a portable lectern between the (uninhabited) choir stalls and the nave. 8 — The vicar spoke fluently and very directly to the congregation, engaging us by eye, with barely a glance at his notes. And the sermon flowed smoothly from one part of its theme to the next. ‘Celebrating Christ the King.’ The reading from Daniel describes a heavenly court, but with one being, the Ancient of Days, who is given power. That is one picture of Christ the King. In another picture, the readings from Revelation and John remind us that our lives are ‘under new management.’ Advent reminds us of this also: that we should relinquish our own management and choose to open the door to our new manager, Jesus. The bell inviting us in. I also appreciated the way in which the prayer leader related each of the half-dozen hymns to the theme of the service, and the prayers of the people (led by yet another congregation member), which embraced several concerns extending well beyond local, including the Brexit negotiations and issues in a sister diocese in Africa. The passing of the peace was fairly prolonged, with (it seemed) every congregation member engaging with every other. Although this helps to bind the congregation together, it did feel a bit much for a visitor. Very few people made for the church porch, through which we had entered, so we stayed in our pew for a bit. A man came to chat with us about where we were from, followed by a lady who pointed to a side door and invited us to join her (and many others) for tea. 8 — It is certainly an inclusive and open congregation where I would find it easy to fit in if I lived in this village. The diversity of the service leaders. It felt like everyone in the church had something to offer and was appreciated.